I've followed some impressive 365 projects on flickr. I've even had friends start their own and I admire them for their ability to do that. Me? Mmmm... I work a bit on the slower side so I'm going to do the next best thing: a 52 project. Each week I MUST complete at least one drawing and write a post on here about it. All posts will be on Wednesday. You can help me out too by commissioning work! Either contact me through my facebook page or through email [email addy is under the CONTACT tab] and we can work out the details. I love doing portraits! For Week 1, I drew a picture of my little cousin Annie... which I decided to do because she is so funny and loveable and because it was her mom's birthday and drawings are thoughtful gifts! This drawing was done on a 9 x 12" piece of Bristol board using colored pencil and a little bit of watercolor. I let Annie hold it and she said "BABY!" and then proceeded to stick her tounge out at the drawing. 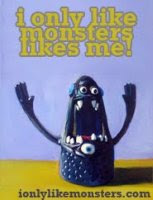 She makes me laugh... and she's a big monster fan too! New show added under the events tab! July 1-2 at Filigrees on Elmwood Avenue in Buffalo! I'll be there from 4-dusk on Friday and noon-dusk on Saturday. Hopefully the weather is nice so I can set up outside! I love Elmwood Ave!